I’m listening to A B & The Sea, “Take It Easy.” They sound like a modern version of the Beach Boys. Plus they’re local. I’m reading watching Dexter, Arrested Development, and My Drunk Kitchen. I’m craving the Birthday Cake flavor from Rick’s Rather Rich Ice Cream. I’m always a chocolate girl, but this was truly birthday cake in a cup. I’m coveting this Marc by Marc Jacobs dress, which is strange because it would look terrible on me. And I don’t love Marc Jacobs anything (despite a couple of successes). I hunted this thing DOWN. It appeared in an email ad for shoes and I went off searching. I think it’s the color-blocking that’s drawing me in. Because that dress is such an unusual love for me, I’m adding an extra coveted item. 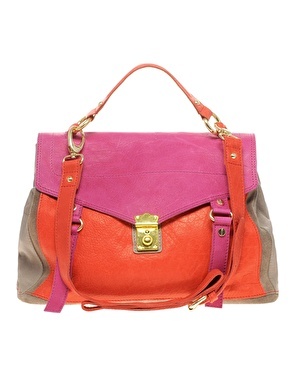 Like this ASOS satchel. More color-blocking! Plus I think ASOS has some of the best designed bags out there at this price point. I’m dying to find out how the in-person quality compares.